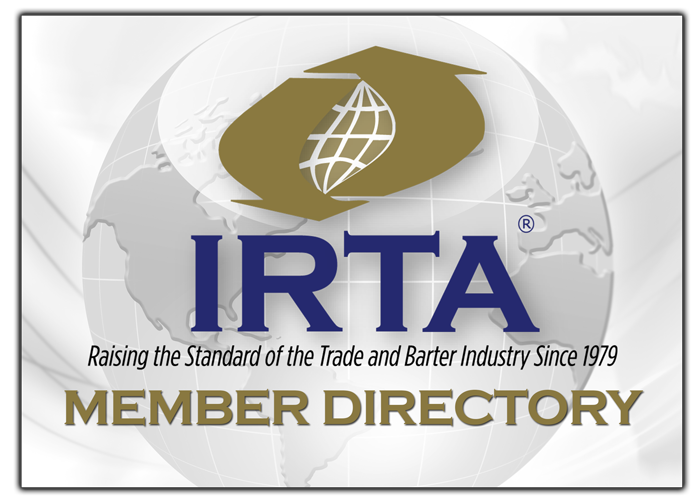 IRTA, www.irta.com, was founded on August 31, 1979 to foster the common interests of the commercial barter industry in the United States and worldwide, and to uphold high standards of ethical business practice. IRTA works with all sectors of the barter industry to preserve, protect and enhance the industry. IRTA also interfaces with governmental agencies, the media and the public to promote the numerous benefits of barter systems as an important component for economic development. IRTA conducts research into contracts, securities and tax laws and accounting principles applicable to the retail barter, corporate barter. complementary currency systems and counter trade organizations. Through its subsidiary, Universal Currency Clearinghouse, Inc. (UC), IRTA provides the most robust and successful global inter-exchange trading platform in the world. UC was created in 1997 and continues to set trading records on a regular basis. In 2015 UC co-developed its own proprietary software with BPS Technologies – the software was launched in August of 2015 and has significantly contributed to the growth and success of UC. IRTA also provides a consumer protection program via its Ethics Complaint and resolution process, which is available to both IRTA members and non-IRTA members alike. As of 2016, IRTA has over 100 members in the commercial barter and complementary currency sectors. Members of IRTA are from the U.S., Canada, Great Britain, Australia, China, Singapore, New Zealand, Italy, Poland, Portugal, France, Holland, Brazil, Mexico, Turkey, Puerto Rico, Thailand, Saudi Arabia the UK and Sardinia. Membership is open to any individual or firm who subscribes to the aims of IRTA and who has not been convicted of a serious criminal offense or was the subject of a civil judgment involving fraud. International trading firms, barter exchanges, corporate barter companies, counter-trade organizations, complementary currency groups, and governmental agencies or banks who have a keen interest in the barter industry, are all welcome to apply for membership in IRTA. IRTA is governed by an 11-person Global Board of Directors which meets regularly to review IRTAs progress and set goals for the future. An Annual Meeting of IRTA is held each year at the annual convention in September. The 2016 IRTA Convention was held from September 22nd through 24th, 2016 at the Hard Rock Hotel in Riviera Maya, Mexico – over 100 people from 40 barter organizations around the globe attended. The convention included two days of speakers and seminars aimed at educating and increasing the competency of those serving the barter and complementary currency sectors. This year’s 2017 convention is scheduled for September 14th through 16th, at the Grand Oasis Resort in Cancun, Mexico. See the “News” tab of our website and sub-tab “Convention News” for more information. In an effort to continue to provide quality barter industry education, IRTA also offers the Certified Trade Broker (CTB and Registered Trade Broker (RTB) training and accreditation programs at the convention, and is hoping to move the CTB/RTB programs online in 2016. IRTA is currently working with States in the U.S. that are looking at revising their financial regulations in response to the growth of crypto-currencies in the U.S. and worldwide, (see the Crypto-Currency section under the IRTA Library tab on this website). IRTA is pro-active with these jurisdictions so as to protect the barter industry against the adoption of any new statutory language that could potentially adversely affect the barter industry. In June of 2014 IRTA received a favorable opinion from the California Commissioner of Business Oversight ruling that barter exchanges are not considered money transmitters under the proposed new California financial guidelines. IRTA also received a similar favorable ruling regarding crypto-currencies from New York State in late 2014. On February 7th, 2017 IRTA released an important new Advisory Memo titled, “Proper Reporting of Assets and Liabilities of the Managing Exchange vs. The Exchange Members & IRS Reporting Requirements Regarding Client/Member Bad Debt Accounts.” The Advisory Memo’s conclusions are supported by the Chicago, Illinois accounting firm of Manning Silverman & Company. IRTA provides professional consulting services regarding all topics related to the barter industry. Recently, in December of 2015, IRTA submitted research reports were prepared the International Islamic Trade Finance Corporation (ITFC), the development arm of the Islamic Development Bank, IDB) and the Department of Economic Development (DED) of the Government of Dubai, United Arab Emirates (UAE). For more information on IRTA, contact IRTA’s Executive Director, Ron Whitney at ron@irta.com or 757-393-2292.